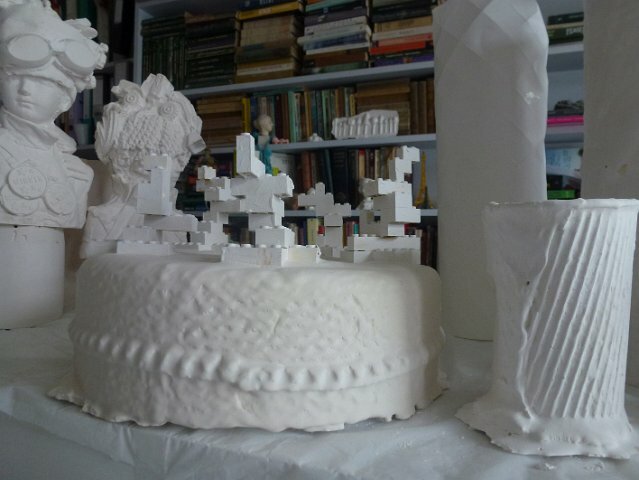 The 19th April 2013 will mark the end of a long artistic journey for me when 32 of my plaster busts will go on show at Pitzhanger Manor, historic house and summer residence of celebrated 18th century architect Sir John Soane. I was invited to show the collection and to create an installation in the museum more than a year ago and then it seemed like I had acres of time to make lots of new busts including four much larger ones than I had made before. But somehow in the last 4 months time seems to have been concertinaed and every day in the studio I've been counting off exactly how many days and hours I have left to finish everything and desperately trying not to panic! 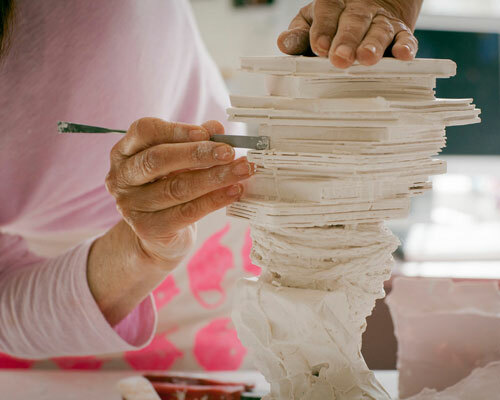 This post records some of those days in my studio in recent weeks. The space has become smaller and smaller as the volume of casting has increased day by day! This is Tomcat - one of the new large busts. 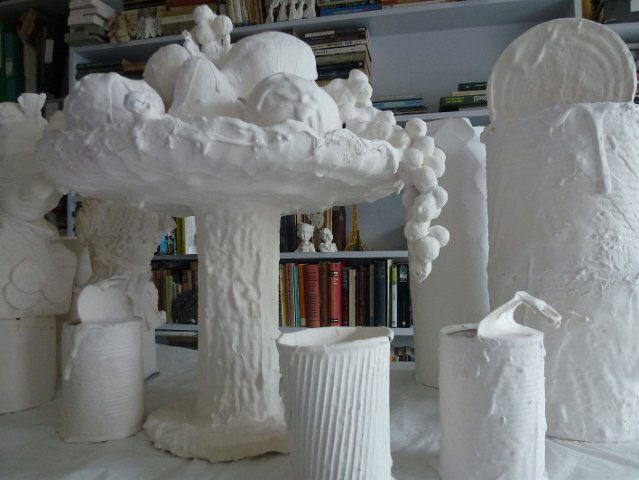 The characters in my plaster bust collection are going to be well occupied during the show as I've created a four metre long banquet for them! Like them, EVERYTHING at the banquet is in bright, white plaster - like these cut 'crystal' wine glasses. 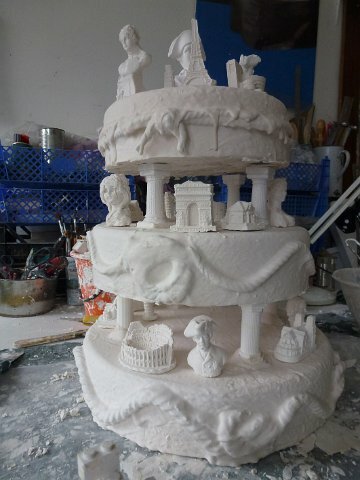 The focus of the banquet table, a multi-tiered cake decorated with miniature buildings and busts - as used in my sculptures. Eiffel Tower Tart - anyone want the recipe?? 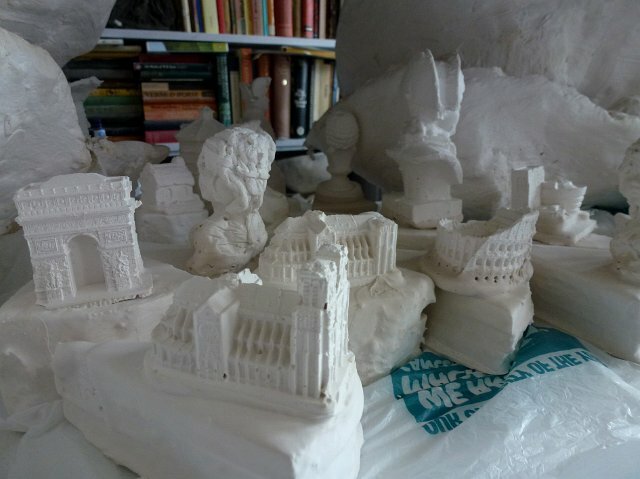 By this time I have quite a collection of miniature buildings - I always make a bee-line for tourist shops when I'm on my travels and I've used lots of iconic landmarks on the headgear of the busts. There's not often much colour in my studio but it wasn't long until this fake fruit was reduced to an impasto whiteness like the rest of my sculpture. I've increasingly been using all kinds of low key materials when creating the busts, including packaging, card, vacuum-formed blister packs etc etc and I've referenced this in some of the 'tableware' at the banquet. ...........and all kinds of random 'banquet' things from my many charity shop trawls. Have you tried Lego cake??? I'm told it's delicious! 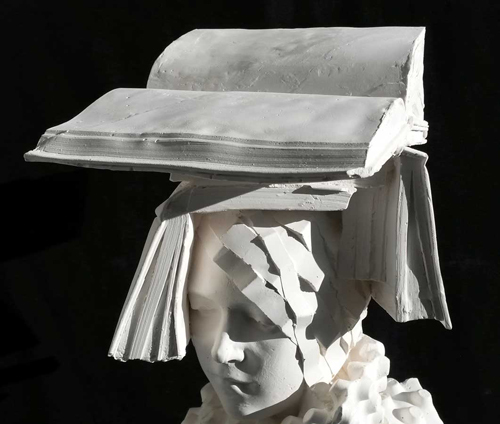 Another of the new, larger busts, Bookworm. Lobster, crab, roses, grapes and wine served in decanters - all the luxe for The Secret Society! At the banquet, I'm also including various things which I use in the studio - like tin cans and sieves! Actually, I like the shape of sieves, abstract and asymmetric. Absolutely nowhere to put your feet! My floor space has shrunk further every day. 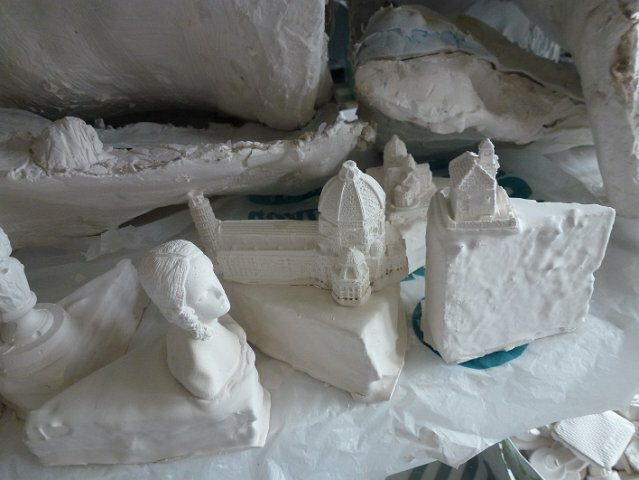 One of the main reasons I'm looking forward to installing the exhibition is that it will mean NO MORE PLASTER CASTING for a while!!! Lugging 25kg sacks up to my first floor studio and having every drop of moisture sucked from my skin is starting to wear me down. 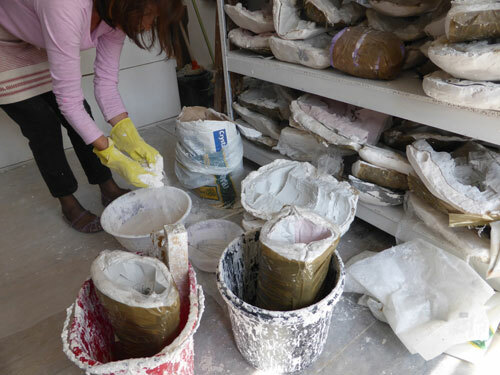 I have absolutely no idea how many bowls of plaster I've mixed over the last few months but it must be hundreds. 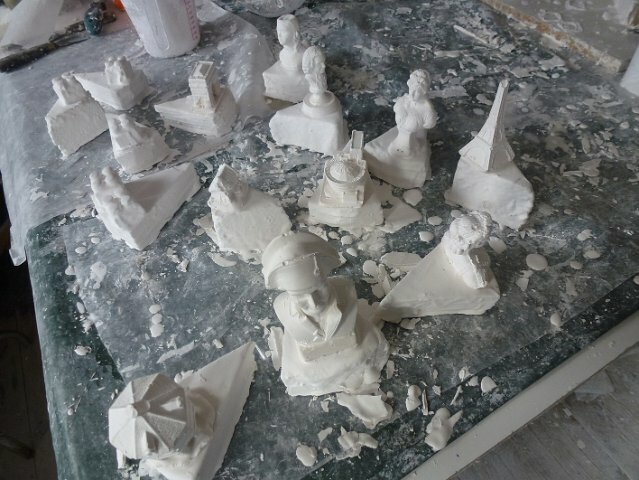 I've cast 2 of each bust which makes 64 altogether plus 64 plinths. Pitzhanger has the most wonderful interior architecture including niches, plinths, shelves and fire mantles so as well as the banquet table there will be plenty of places to site the busts. That's going to be the fun bit. Anyway, to see my crazy banquet and all the new work you'll have to visit the show - or if that's out of the question wait a couple of weeks until I post the video I plan to make of the installation. 64... no wonder you have been so quiet!! Love the new photos of your book lined studio, how about some metal casting for a change I should have my own Benin Bronze style backwoods foundry in production this summer. Can't wait to see your exhibition at Pitzhanger Manor... we are sure it is going to be the talk of the Art Scene and a fantastic success!!! Wow .....really nice and great informative post.I really like this beautiful blog pic.Thanks for share with us.